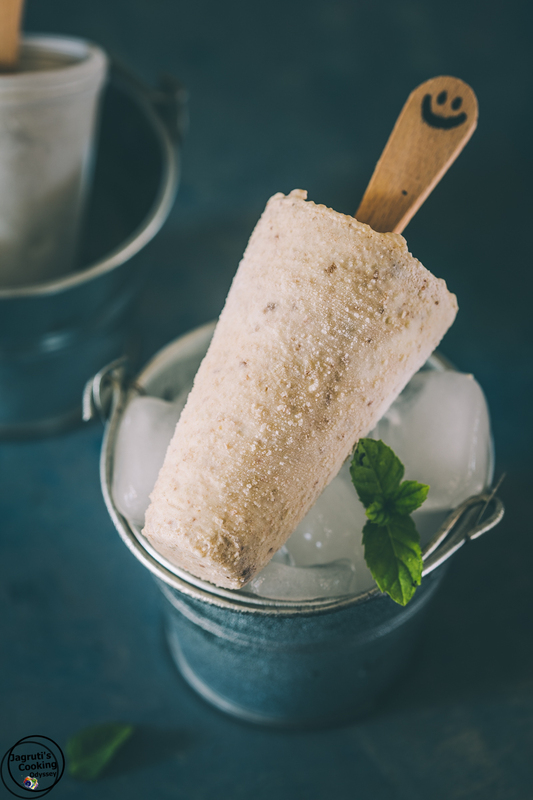 A perfect treat for Summer hot days, these Sugar-Free Cashew, date and Yogurt Popsicles are definitely to satisfy your sweet taste buds and beat the heat. They are loaded with nothing but a bucket full of goodness. Creamy and rich but with healthy fats, naturally sweetened and packed with plenty of vitamins and minerals and these take a few minutes to prepare and popular with adults and children alike.Only 3 ingredients needed. Can you top this? In my part of the world, currently, we are having 'Indian Summer', it is unbearably hot. Almost I am dreaming of having air conditioners and a paddling pool.The days are hot and nights are hotter. This year since March-April we are having warmer temperatures and experts are warning that we are most likely to witness a tropical weather during these summer months. Obviously, now that temperatures seem to be increasing day by day, we are looking for ways to avoid the heat. We try not to expose ourselves to the direct sunlight more than 10-15 minutes, definitely drinking more and more water and masala chaas to stay hydrated. 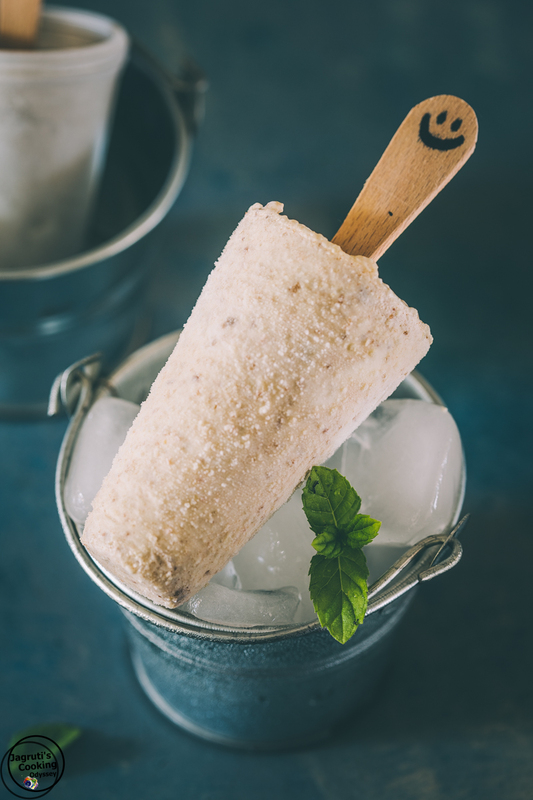 Somehow this year no one has asked for any Ice Cream ( Rich and loaded with sugar and calories) yet, maybe my these Suger Free Mango Basil and Cashew Yogurt Popsicle may just seem to be satisfying our cravings. Also, in these warm mornings Rajasthani Bajra Raabdi- Millet Porridge is popular in my house, this cold millet porridge keeps our tummies filled for longer. and Raw Mango and Onion relish is the best thing ever to keep the heat at bay. A few days ago, I came across with this interesting piece of reading on the net about the popsicle, that whether eating frozen popsicles on very hot days actually cool you down? Or is the "Cooling Down" just an illusion? I was taken surprised by the answer! "No, it's real. Eating anything cold has an effect on your body temperature because it absorbs heat from your stomach, which in turn absorbs heat from your blood. But something that primarily consists of frozen water, like a popsicle, has the most dramatic effect. That's because it takes quite a bit of heat to melt ice, two or three times as much as it takes to warm the popsicle up to your body temperature. Hence, eating a popsicle cools you down at least three times as much as drinking an equivalent amount of cold water. (This also works with ice, but popsicles are more fun)." I am not sure, how much truth there is in this article but if you do decide to eat frozen popsicles, make your own mind up about above article. 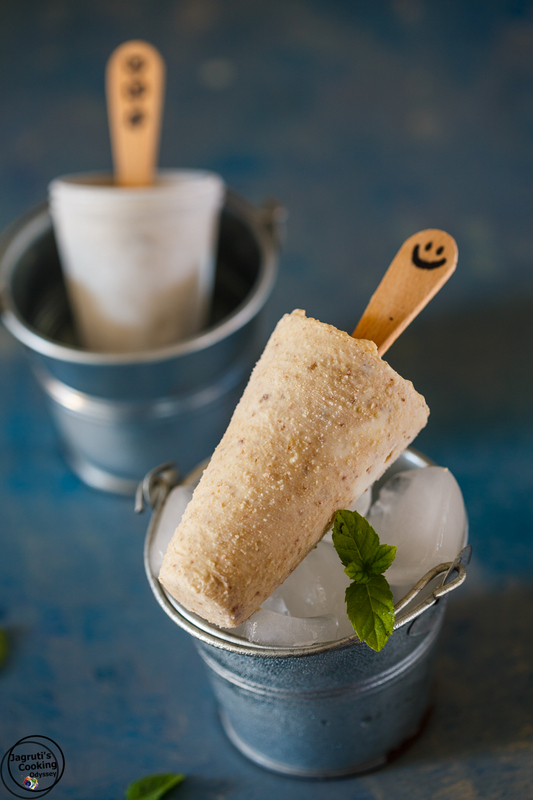 So when my Mango Popsicle vanished into thin air in no time, my sunny boy wanted something similar to that again to cool himself down, and I churned out these Sugar-Free Cashew, date and Yogurt Popsicle which are not only enjoyed by him but I was so pleased to see couple of hands were reaching out to the freezer in search of these healthy and refreshing popsicles. 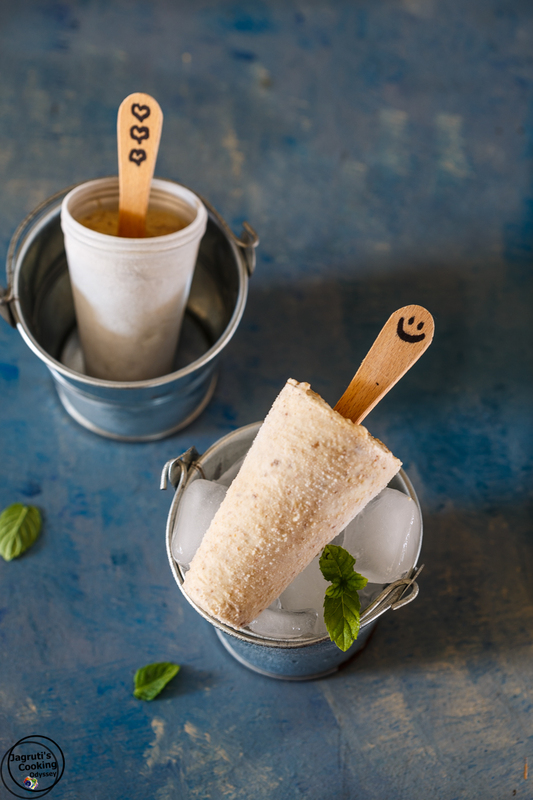 Instead of dates, you can use honey, agave nectar, date syrup or maple syrup to sweeten the popsicle. You can use any other kind of nuts instead of cashews. This recipe can be made vegan, use vegan yogurt. Place everything in a blender and blend till you get smooth smoothie like mixture.Pour equally into popsicle molds and pop into the wooden stick and freeze for at least eight hours, or overnight.To remove the popsicles from the mold, run lukewarm water on the outside of them and remove it easily. Enjoy! I think I must try this ASAP... have loads of almonds so may consider replacing the cashews... delicious recipe and awesome clicks as well! Excellent idea of using almonds, thought came to in my mind too but daughter can't have almonds, so had to stick with the cashews:) Let me how it turns out for you. What a fun treat!! I can't wait to try these as I love dates!! First of all, these photos are gorgeous! And I adore the ingredient list for these popsicles, I can't wait to try them! It's been 117 degrees here in Arizona, now is the perfect time! Thank you Kristine, if you try please let me know how it turns out for you! I love using dates as a sweetener! And I never would have thought of the cashews in this! Looks like a yummy summer treat! Thanks Christina, cashew lends creaminess without being too rich and little bit of crunch too. I love the sound of these popsicles - and your photos are beautiful. Where did you find that backboard? Love the colors! It's pretty hot in South Florida too -- so I'm all about icy treats for the summer! Thank you Patty, I use dates in my many recipes to sweetened the dish. It's funny, you always feel cooler after eating a frozen treat! Looks delicious! oh these looks divine.. I love a good date and cashew combo. I adore popsicles, and I'm so glad to know there's a scientific reason why they are so refreshing on a hot day! This looks so delicious and perfect for this weather we are having these days! Thanks for sharing! This recipe looks so delicious and perfect for the weather we are having these days! Thanks for sharing! These look delicious and so much healthier than all the shop bought sugar loaded ones. I love the flavour combo of dates and cashews and these sounds like the perfect way to cool down in the heat. yummy yummy yummy! Simple love this..I reminded me of kulfi! This is perfect dessert to cool down during a hot summer day. Dates and cashews goes well very well. I can't wait to try this! It sounds fabulous and I have some cashews ready to go!